The Club is planning to take advantage of the Scone Cup Festival to set the scene for its annual three- day bus trip from Friday 10 May 2019 unit Sunday 12 May 2019. 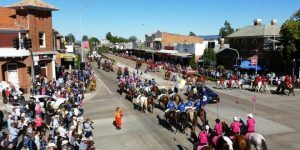 Whilst in past years the annual trip is usually staged over the long weekend in June, this year with the Scone Cup festival and all that it entails it allows members to enjoy and experience a wide range of activities. This includes the Scone races on the Saturday with the feature race the Groupe 3 Dark Jewel Classic for fillies and mares and a host of other black type stakes races, stud tours, Inglis Horse sales, street parades and stalls etc. Reservations have been made at the Grape Vine Motel Denman (rating 4 stars) for a number of deluxe rooms. Checking in on the Friday and out on the Sunday. The studs we will be visiting are yet to be decided. The cost of the three-day trip will be $220 for those driving from other areas and $290 for those going on the minibus from Windsor. This will cover accommodation and breakfast for to nights and two restaurant meals in the evenings. Entry to the members stand at the races will be $20 and $10 for pensioners. For those who do not wish to attend the races there will also be opportunities for independent activities such as shopping, gallery hopping, sightseeing art and craft, wine tasting etc. For more information regarding the trip and itinerary, please phone Barbara on 0437 123 197.